I did not have any morning sickness with Joseph. I was not tired, and I felt EVEN MORE motherly towards Ben and Mikey. I was falling in love with being a mom and the God who called me to be one. 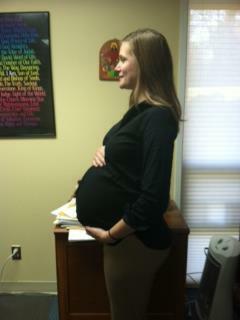 With each pregnancy (planned or unplanned), everything about me pointed to a creator with an awesome plan for my life. My once very skinny, athletic body, gained cushion and curves. I was being transformed to a life-giving machine for the third time, and it brought so many blessings. Because I did not get sick at all and generally felt awesome, I assumed I was having a girl-which made the unplanned pregnancy easier to bear. When I found out he was a boy, I cried. You see, I am a sinful and selfish person. And I wanted a girl. I meet other women who say, “as long as the baby is healthy, I don’t care what gender it is.” Either they are not being completely honest with themselves, or I am just awful. Maybe a little of both. Either way- I will be honest with you. I cried because I was hurt. God knew my heart and what I wanted, and gave me a boy anyways. After a good ol’ cry in my car that afternoon, I got over it. God had blessed my life immensely so far, why would I stop trusting him now? This child was already stretching me, stretching my heart to love and to move beyond myself and my own wants. God was already using him to make me holy.